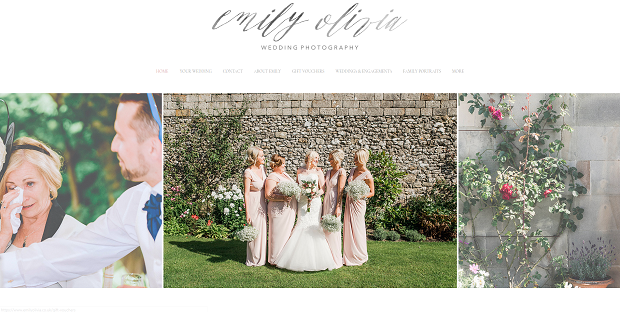 Thinking of adding a slider to your wedding photography website? A carousel is a fantastic way to greet visitors, as well as displaying your work in a small space. This is crucial for a wedding photography portfolio. Here’s what a slider can do for a photography website. Take a look at these splendid examples of wedding photography sliders, and draw inspiration from their great implementation! This elegantly designed website opens with a huge slideshow of the photographer’s best work. While there are no visible navigation elements, you can click to advance the slides, or just let it play. This carousel fits perfectly with the site’s design. This photographer’s homepage is dedicated to showing off a large sampling of their photos. With a compelling downwards-scrolling animation, this slideshow is simply fun to watch. The bullets at the bottom provide an extra navigation option. This homepage uses not one, but two fullwidth sliders, designed to impress you with a small gallery of unique photography. What speaks better for your brand than to show off your style? And these sliders that fill the screen with beauty get right to the point. Amy Booker Photography uses a fullscreen image slider to dazzle visitors with stunning backgrounds. This draws you right in and gives you an up close and personal look at this photographer’s art. The slideshow doesn’t advance on its own, so you can take your time marveling at each photo. This carousel is the highlight of the homepage, displaying a carefully-picked selection of this photographer’s amazing work. The pastel, light colors lend perfectly to the simple white background, and the slider even comes with a lightbox to let you get a good look at these gorgeous photos! Being able to see the previous and upcoming photo is a nice touch as well. Besides the stylish fullwidth slider that introduces you to the site, Sarah Lynn Photography also incorporates a smaller slider. This one advertises other services, like a retouching studio, blog posts, and templates. Both sliders are implemented beautifully and look great with this website’s theme. This carousel is chock full of flashy, vibrant photos. Drag the slider to look at them all, or click play and let all the pretty photography fly by. Images in this slider have a nice faded effect that disappears when clicked on, letting the previous photos fade into the background. This near-fullscreen slider gives you a crystal-clear look at this photographer’s work. The candid photos work well here, allowing you to see the little details of each shot as you navigate with bullets and arrows. This photography slider is the centerpiece of the homepage, introducing you immediately to this photographer’s stunning pictures. The slider takes it slow, only advancing occasionally, and giving you time to stare at each photo that appears. When you’re done, the stylish header pulls you down towards the rest of the gallery. If you’re running out of space on your wedding photography website, why not use a slider to present your photos? A slideshow is a great way to present compelling photography, as these websites demonstrated. Now it’s time to create your own carousel of gorgeous photos! Not convinced? Here are some more amazing slider examples, and some of your options if you choose to go with Soliloquy. And please follow us on Facebook and Twitter for more slider tutorials and website showcases!